It's often hard for people to understand Judaism. Judaism is more than a faith; it's also a people, a culture and a shared history. People often compare Christmas and Hanukkah, but Hanukkah is not a major holiday. It's considered a very minor holiday compared to Passover in the spring or the High Holidays in early fall. 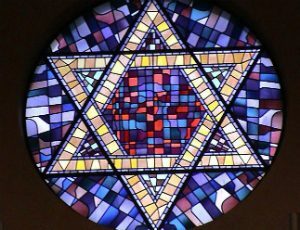 Judaism is something that I live every day; it's an integral part of my identity. One could say the same for the teen characters in these books. Little & Lion by Brandy Colbert: Suzette's life is filled with secrets—those she keeps from her classmates at boarding school, her friends from home and her parents. Eventually, those secrets start to suffocate her. Suzette's Judaism is a large part of her identity, from her excitement over becoming a Bat Mitzvah, to the family's weekly celebration of Shabbat, and even the Magen David necklace she stopped wearing when she went away to boarding school. Little & Lion is available in multiple formats. Nick & Norah's Infinite Playlist by Rachel Cohn and David Levithan: When Norah agrees to be a stranger's girlfriend for five minutes, she doesn't imagine that by the end of the night she would be discussing the concept of Tikun Olam over blintzes and borscht. From the casual 'oys' to the possibility of living on a kibbutz instead of college, Norah being Jewish truly is "something that is and not something that's like." Nick & Norah's Infinite Playlist is available in multiple formats. X-Men: Magneto Testament by Greg Pak: Which side of right you are on is all in the eye of the beholder. Magneto, both Charles Xavier's best friend and worst enemy, came into his powers as a Jewish child at the Auschwitz death camp. As a direct result of surviving the worst the world has to offer, Magneto stops at nothing to keep his new mutant family safe. X-Men is available in multiple formats.